The Atari Jaguar was a flop. Though, despite being discontinued in 1996, the console continues to get lovely made games from indie devs. Never say die! The latest game is Mad Bodies, a Breakout-style shooter. The game's developer Force Design worked on this title for six years — something even more remarkable when you consider that the Jaguar had already been discontinued for eight years. 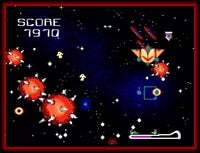 The humorous title boasts 10 stages, digital speech samples and multiple power-ups and weapons. Priced at US$80, the game features "oversized plastic clamshell case with full color cover and cartridge label, and a semi-gloss, black and white instruction manual." Pricey, sure, but we're assuming that this is the best new Jaguar game that will be released this year — next year, too. We don't know about the year after that, though. That year is wide open.